In stock -This product will ship today if ordered within the next 1 hours and 57 minutes. 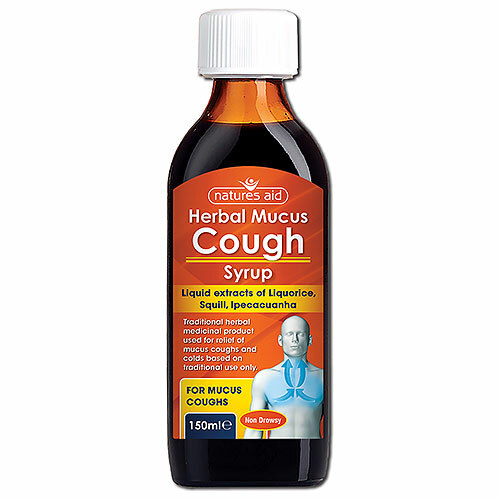 Natures Aid Mucus Cough Syrup is a Traditional Herbal medicinal product used to relieve the symptoms of mucus coughs and colds. Based on traditional use only. The active ingredients per 5ml of syrup are: 0.007ml liquid extract from Ipecacuanha root (Cephaelis ipecacuanha (Brot.) A. Rich.) Extract solvent: Ethanol 80% v/v, 0.125ml liquid extract from Liquorice root (Glycyrrhiza glabra L.) Extract solvent: water, 0.26ml liquid extract from Indian Squill bulb (Drimia indica (Roxb.) JP Jessop (1:5) Extract solvent: Ethanol 55% v/v. The other ingredients are: pumilio pine oil, capsicum tincture (capsicum oleoresin), arrowroot, menthol, peppermint oil, anise oil, sucrose, black treacle, honey, acetic acid glacial, sodium benzoate (E211), ethanol and purified water. Take the syrup by mouth. Adults, the elderly and children over 12 years: Take 2 x 5ml spoonfuls every 4 hours if required, but not more than 4 doses (40ml) in any 24 hours. Not recommended for children under 12 years. Do not use for more than 7 days. Do not take more than the label tells you to. Contains 2.3g of sucrose per 5ml dose. If you have an intolerance to some sugars, contact your doctor before taking this medicine. Also contains 3.7% vol. ethanol (alcohol). If affected by alcohol, do not drive or use machines. An allergy to any of the active ingredients. An allergy to colophony (pine resin) which is contained in some cosmetic products e.g. lipsticks and eye shadow. Any type of heart or circulation complaint. For any heart problems or high blood pressure. Digoxin or any medicines for a heart condition. Medicines that may affect potassium or sodium levels in the body. Medicines which may interact with alcohol e.g. metronidazole. Do not take with other liquorice containing medicines as serious side effects may occur e.g. water retention, high blood pressure, irregular heartbeat. If symptoms worsen or persist for more than 1 week consult your doctor or qualified healthcare practitioner. Consult your doctor before taking this medicine if you: have high blood pressure, a liver disorder or low potassium levels (hypokalemia). If you have difficulty breathing, fever or discoloured green phlegm talk to your doctor. Do not use if you are pregnant or are breastfeeding. Below are reviews of Natures Aid Herbal Mucus Cough Syrup - 150ml by bodykind customers. If you have tried this product we'd love to hear what you think so please leave a review.